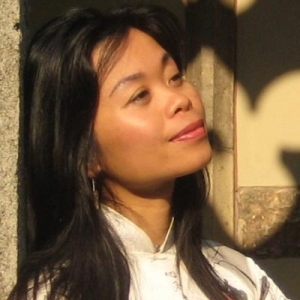 Nguyen Phan Que Mai, the author of The Secret of Hoa Sen (BOA Editions, 208 pp., $16, paper), was born in 1973 in a small village in what was then North Vietnam. She has published many poetry books and has won many honors. 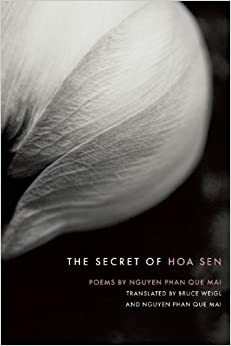 I could not read the Vietnamese versions of her poems, but had to depend on the translations she did with Bruce Weigl , who also translated this volume. Weigl, who wrote Song of Napalm (1988) and other books of poetry, served with the 1st Air Cavalry in Vietnam from 1967-1968. He is one of the most honored poets who took part in the Vietnam War. In The Secret of Hoa Sen we first get a poem in Vietnamese and then, on the next page, the English translation. Many of the poems deal, directly or indirectly, with the American war in Vietnam. “With a Vietnam Veteran, for BW, ” is my favorite in this small book. Two people are eating pho with chopsticks, and steam rises from those bowls of hot noodle soup. in the pain of Agent Orange. I agree with the poet that the Vietnam Veterans Memorial is “Black, silent, /the silent answer for thousands of questions.” But the questions must still be asked. Poetry is an effective and beautiful way to deal with the horrific aspects of war that have marked all of us. Those who have been avoiding Vietnam War poetry should try this book. You might find it surprisingly affecting.